Paris, 1953. By Marc Riboud. © Marc Riboud/Magnum Photos. 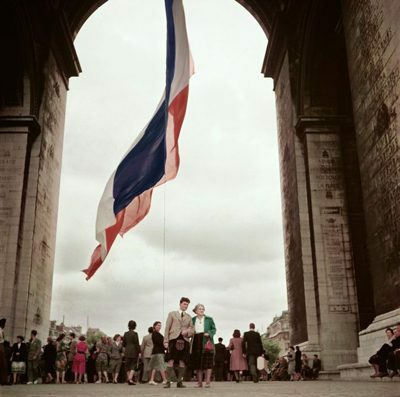 A free exhibit of 150 photographs chronicling the sometimes turbulent history of Paris, its residents, and its challenges and triumphs throughout the 20th century has just been extended by a month so that Parisians and visitors to the City of Light can experience the region’s rich history as seen through the artistic visions of some of the world’s best photojournalists. The exhibition, titled “Paris Magnum,” is held at Paris’s Hotel de Ville—the gorgeous city hall building on the Right Bank that is otherwise off limits to the general public. All of the photos currently on display were taken by 30 photographers from the renowned Magnum photo agency, an organization founded in 1947 and known today as one of the planet’s most prestigious photography groups. “Paris Magnum” is divided into five sections that are organized chronologically: Magnum Before Magnum, which includes works from the 1930s and 1940s taken by the agency’s founders before they formed the organization; Poverty and Anxiety, focusing on the post-World War II years of 1945-1959; The Swinging Sixties; Reaction and Philosophical Resistance, focusing on the 1970s and 1980s; and Picturing Marginality, which includes works from 1990 through today. 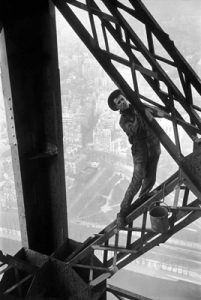 Among the many specific French historical events covered by the exhibit are the labor strikes of 1936, the liberation of Paris during World War II, France’s war in Algeria, the student uprisings of 1968, and the building of such Parisian landmarks as the Pompidou Center, the Louvre pyramid and the La Defense business district.The exhibit, which opened just before last Christmas, was originally scheduled to conclude on March 27, but recently was extended an additional month through April 25. “Paris Magnum,” displayed in the Hotel de Ville’s Salle Saint-Jean, is free and open to the public from 10 a.m. to 6:30 p.m. Monday-Saturday (closed Sunday). 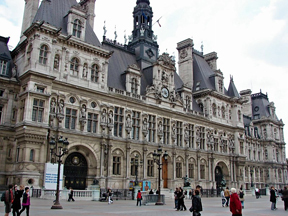 Access to the exhibit is through the city hall entrance at 29 Rue de Rivoli (Metro: Hotel de Ville). This entry was posted in Art, French culture, French history, History of Paris, Right Bank and tagged "Paris Magnum", Hotel de Ville by Bob Adams. Bookmark the permalink.